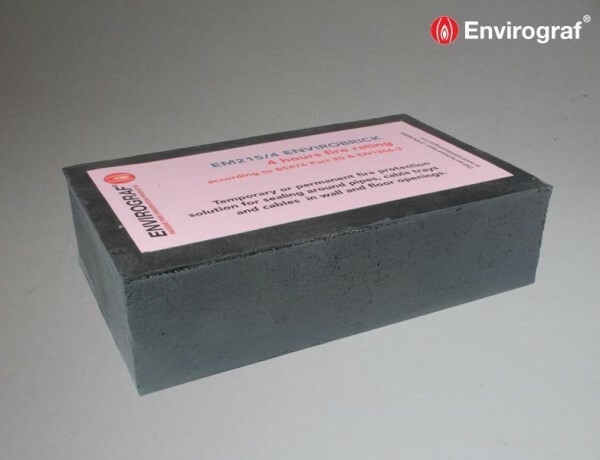 Envirobrick is very easy to install. Can be cut to fit if necessary using a sharp knife. Lay the Envirobrick rectangular blocks as bricks to fill any size opening. Can be fitted either way into hollow plasterboard walls – if fitting into a hollow partition wall greater than 200mm we can make a wall lining to fit into the width of the opening first. Envirobrick circular seals can be used for filling circular holes or pipes and can be cut for pipes, cables, trunking etc to pass through. Envirograf® black mastic can be used to fill any open joints. 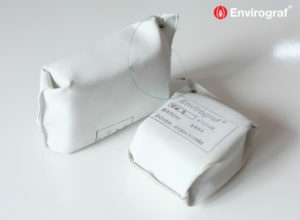 Envirobricks can be removed and refitted as required. Tested to BS476 Part 20 & EN1366-3, achieving up to 2 hours fire protection. Acoustic properties tested to BS EN ISO 140 Part 4 (57 dB).